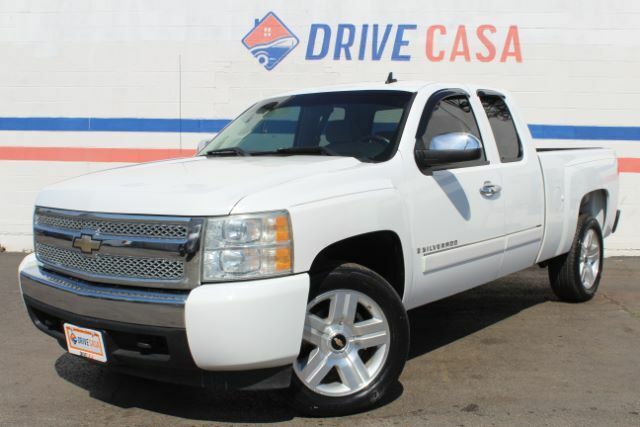 Meet our great looking 2008 Chevrolet Silverado 1500 LT1 Extended Cab 4X4 in Summit White. Powered by a 5.3 Liter V8 producing 315hp while connected to a 4 Speed Automatic transmission to help with passing or towing needs. Our Four Wheel Drive offers near 18mpg on the open road while showing off a chrome grille, fog lamps, bed liner, and a tow package. Slip inside our LT1 and feel the supportive seats wrap you in comfort. Fall in love with driving all over again when you see all the amenities that make life easier. Power windows, power door locks, and remote keyless entry. Turn up your favorite song with the fantastic sound system; you''ll be treated to an AM/FM radio, CD player, and an auxiliary audio input jack to play just about any device you wish. Go ahead and take another look at our pictures and see for yourself! Here at Drive Casa we pride ourselves on customer service and quality vehicles. As one of the premier Buy Here Pay Here dealers in Texas, we are passionate about helping people with poor credit or no credit at all get financed through our in-house program. Every vehicle comes with a 12 month/12,000 mile limited warranty. To top that, oil changes are on us for the first year of ownership! Stop by or call us today! We are here for you! Aqui en Drive Casa nos enorgullecemos de servicio al cliente y vehiculos de calidad. Como uno de los distribuidores principals de Buy Here Pay Here en Texas, nos apasiona ayudar a las personas con mal credito en lo absoluto o ser financiados a traves de nuestro programa interno. Cada vehiculo viene con una grantia limitada de 12 meses / 12,000 millas. Por encima de eso, los cambios de aceite estan a nuestro costo el primer ano de propiedad! Venga o llamenos hoy mismo! Estamos aqui para ti!